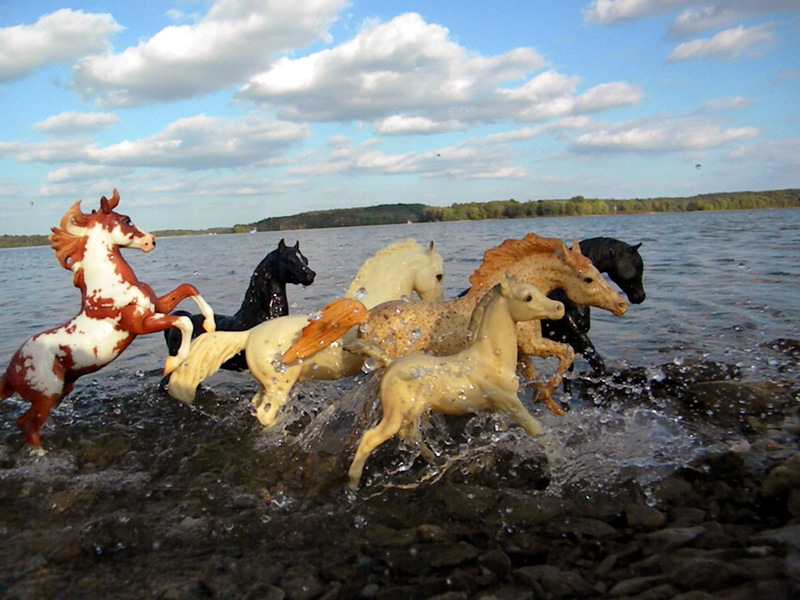 If you don't already know, there is a massive collection of collectors of model horses, and an entire genre of photography dedicated to them... also youtube videos, but that's another story. 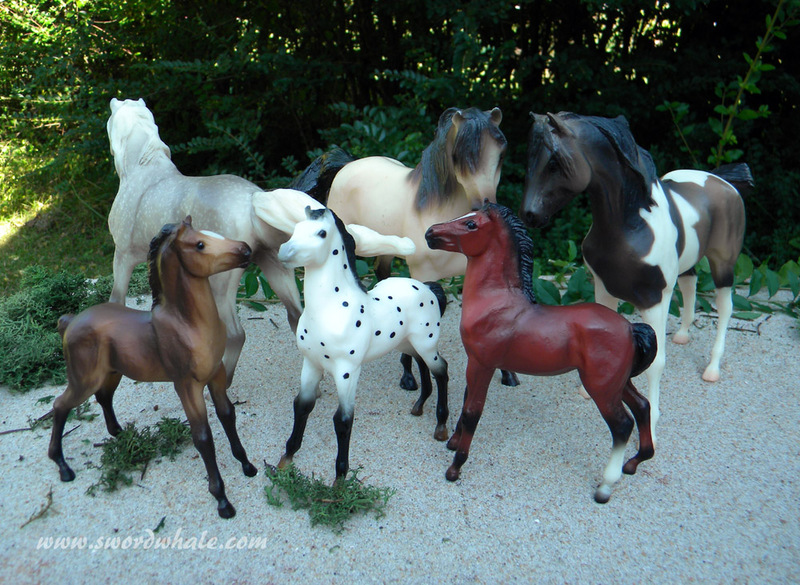 I've collected model horses, especially Breyer, since I was four... that's 1959, and yes, I have some of those classics on my shelf. 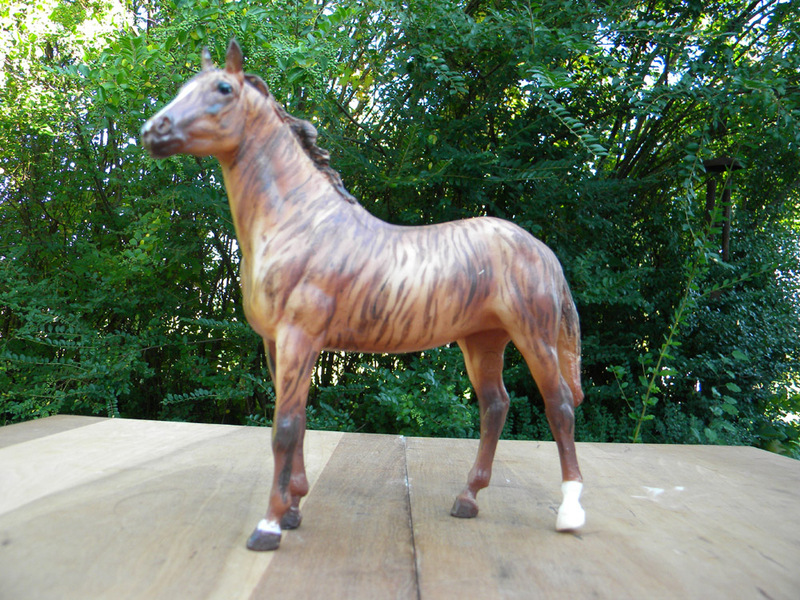 Modern collectors often repaint, reposition and resculpt already beautiful sculptures to make unique individual horses which they show in model horse shows (live or photo). 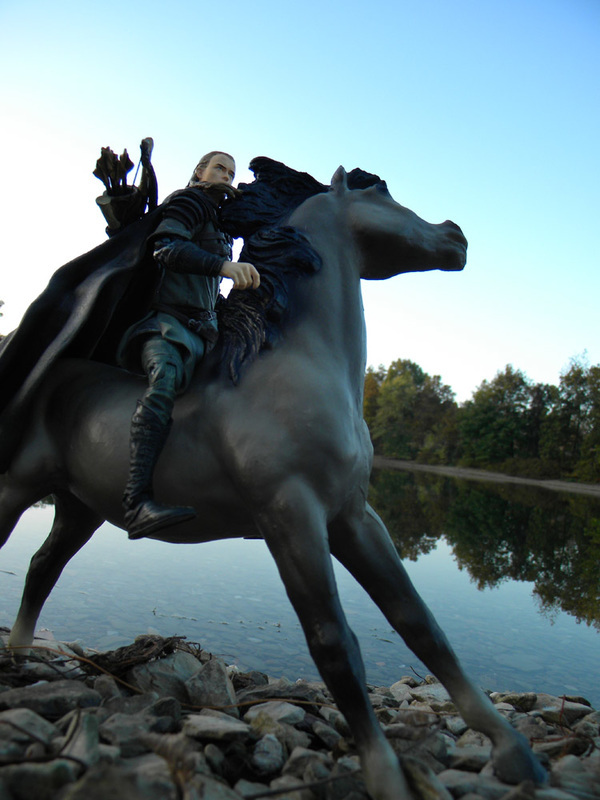 Some collectors have taken the photography of these models to a high art. 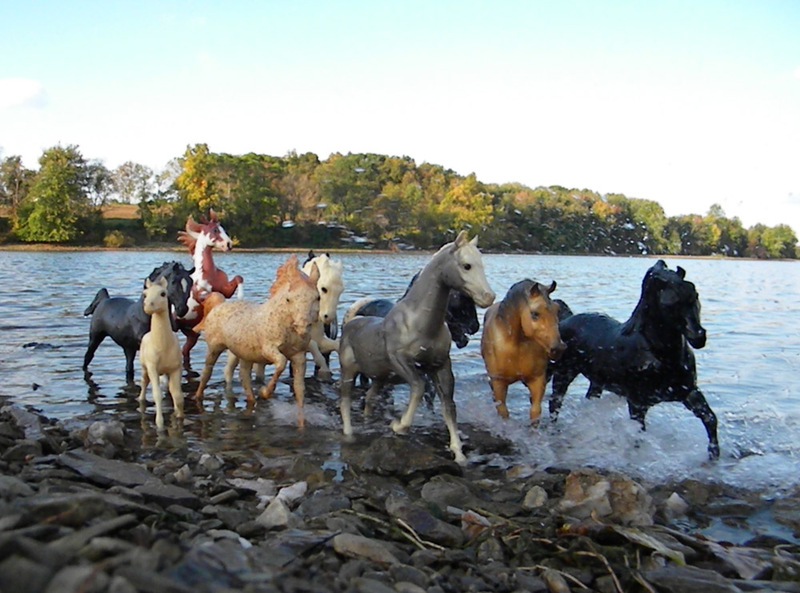 And there is a whole genre of youtube videos of kids making movies starring their collectible horses (and dolls and dogs and...). It's the kind of play, storytelling, that I did as a kid. Don't let your collectibles sit on a shelf, honor the artistry and beauty of these great models, tell a story, take them off the shelf and have fun. 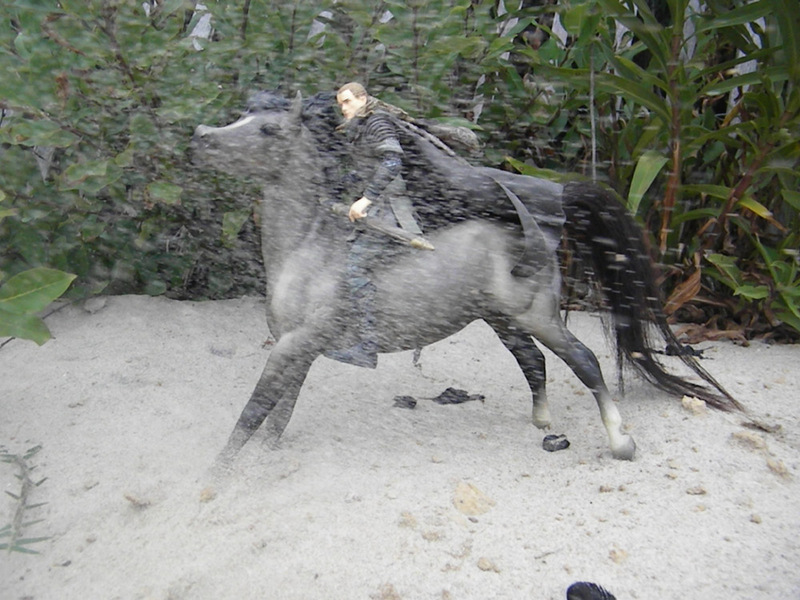 OK, I threw a handful of sand in that last one, but it was a total sandstorm below the knees and the horses kept blowing over. This can be annoying... it can also be a useful effect. Blowing sand looks great and authentic in your shot. Spray bottles can create scale rain or mist. Use your landscape. The sand here had a wonderful rippled effect (two kinds of minerals, light and dark, sorted by the wind). 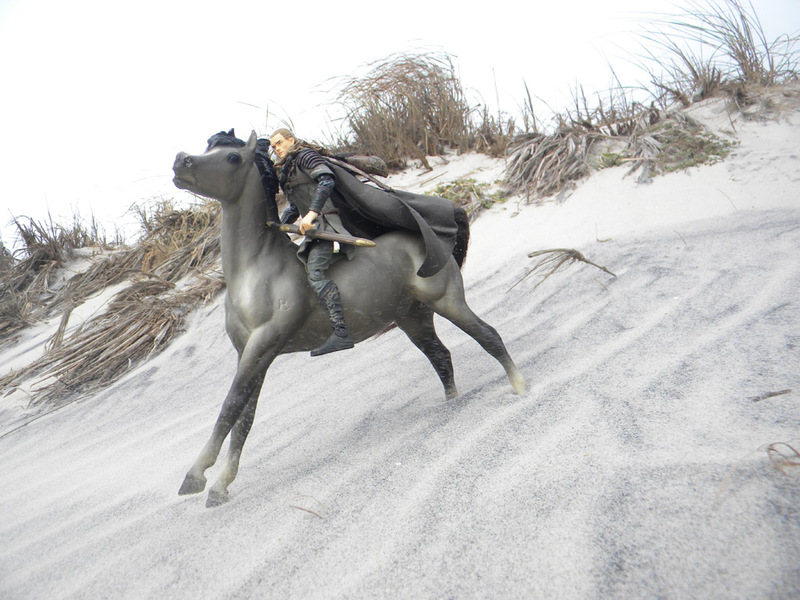 The beach grass is blowing, which adds to the effect of the running horse and the flying cloak. You can see the ground blizzard against the horse's legs! 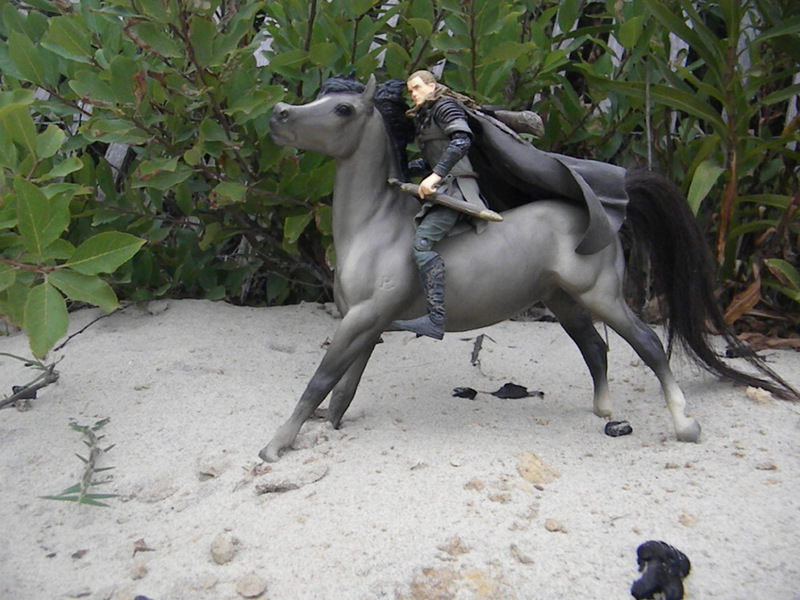 Breyer's Smokey (aka: Arod, here with Legolas) is in a perfect pose for dancing down a slope. Do not fear the closeup. 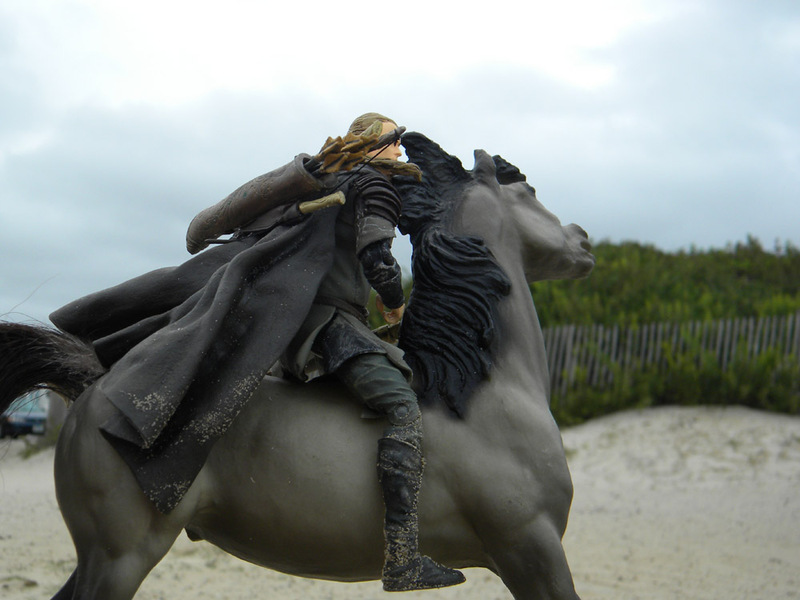 Mud and stuff: don't forget, your hero has been travelling and probably has sand/mud/whatever stuck to his boots/cloak/whatever. 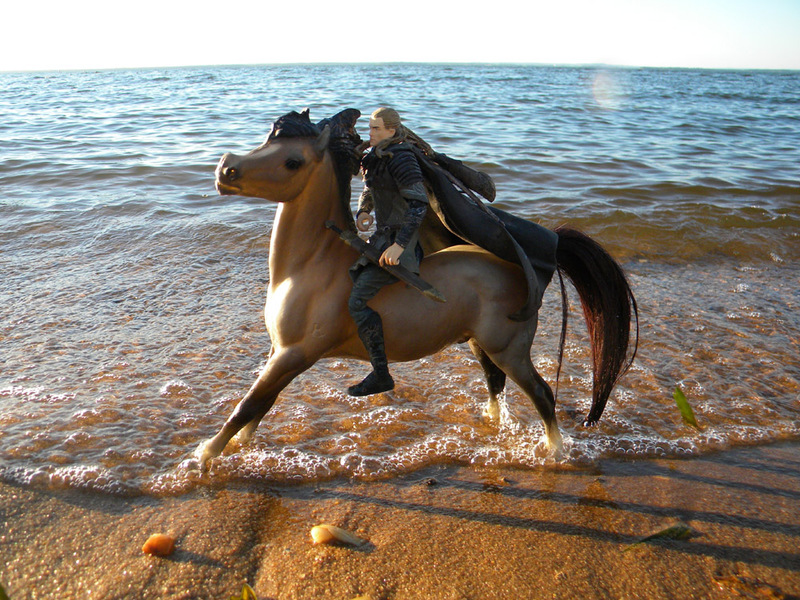 His horse is really clean. Self cleaning horse. 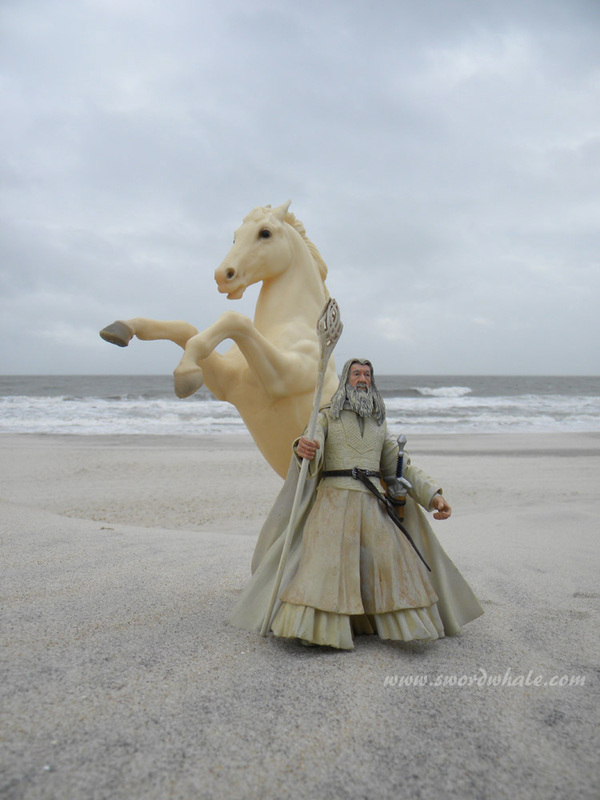 a friend once said "fantasy is a clean white horse". What's your eye level? Staying at the eye level of the models makes them look more real. Going into aerial mode often makes them look like ... well...models. ​This is my backyard. Ho hum. Also, grass is out of scale (too big). 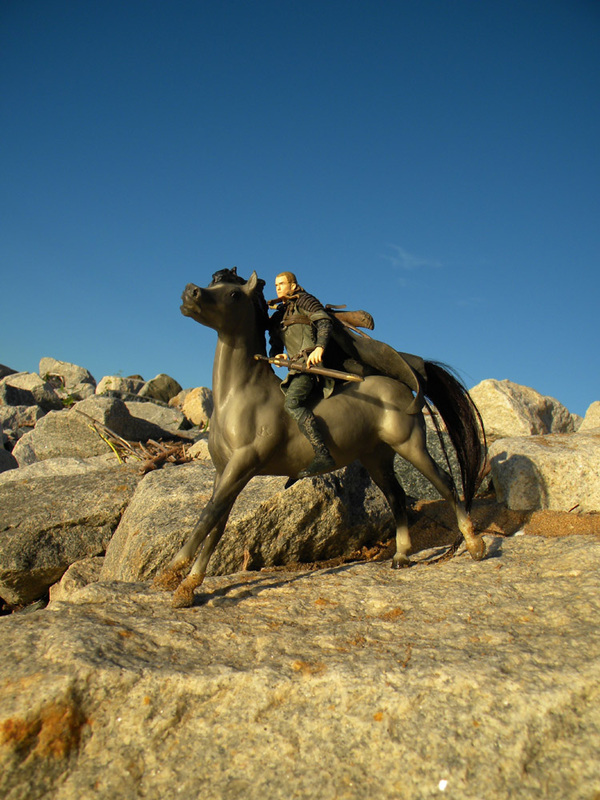 Legolas and Arod look more epic when photographed from a low angle... the cliff doesn't hurt either (rip rap rocks at Betterton Beach MD). Water has scale. While the water looks a little gloppy in the aerial shot (small waves close to the model) here the ripples are farther out. The bubbles are a wee bit large, but not obtrusive. 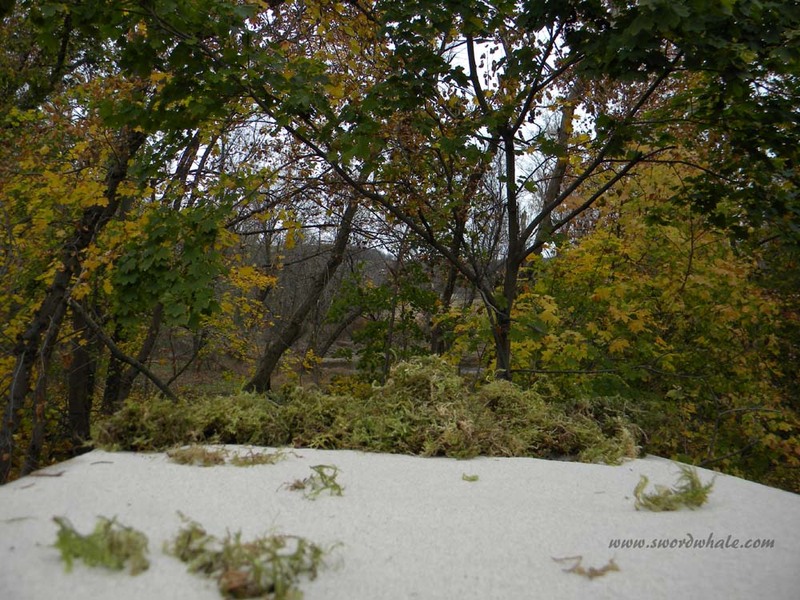 ​This is the same backyard, looking the same direction. This is the tree you can see in the top left corner of the photo to the left. Same time, same sunlight, same direction, same tree. I just moved closer to the tree and found a whole new landscape under it. To get these effects along the shores of Lake Marburg I threw rocks, bowls of water and wiped a lot of water off my camera. 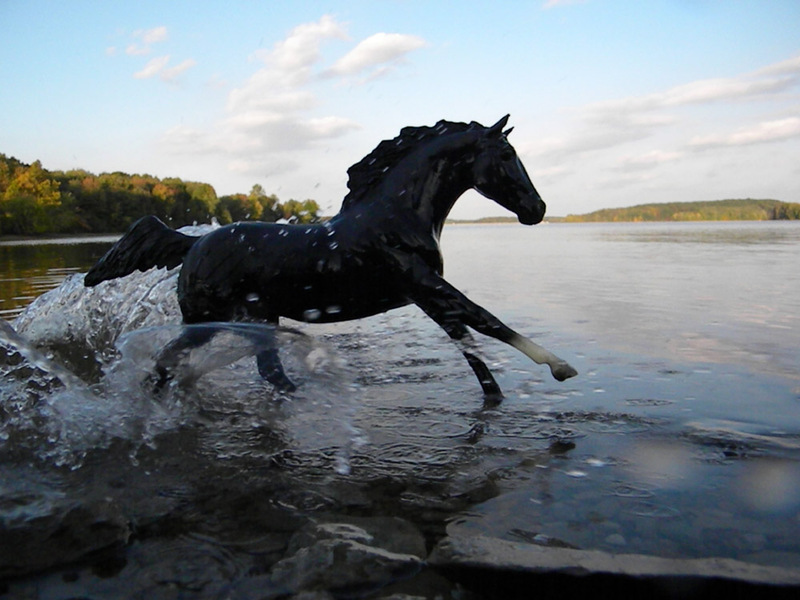 I used sport continuous mode on my Nikon Coolpix L100 to capture the motion. You could shoot video and do a screencap though the quality would be less. Be prepared to shoot a lot of pics. Remember: water has scale! (see derps below). Seriously: the first thing is to stick your camera on a tripod (or other snowproof and immobile surface). In this case I had two snow covered tables outside, facing the lovely valley of the Conewago Creek. Working on the ground would have been harder on me, and harder to stabilize the camera. This snow was generally wet and mushy (no good for flinging) but it was late and it was starting to set up and get crunchy. The snow on the tables powdered nicely. I used the Eastern Neck map (a piece of mat board would be better, in a color closer to that of the horse) because it was what was in the van and it was darkish, allowing the camera to focus on it and get the exposure right rather than underexposing due to the snowy background. I focused on the map (held against the horse), tossed the map, grabbed a handful of snow, scrunching it up to powder, meanwhile keeping the shutter release at halfmast (chirp chirp), then pressed the shutter all the way and flung the snow. Make sure you're flinging the snow in the right direction, one that makes sense with the direction the horse is "moving". 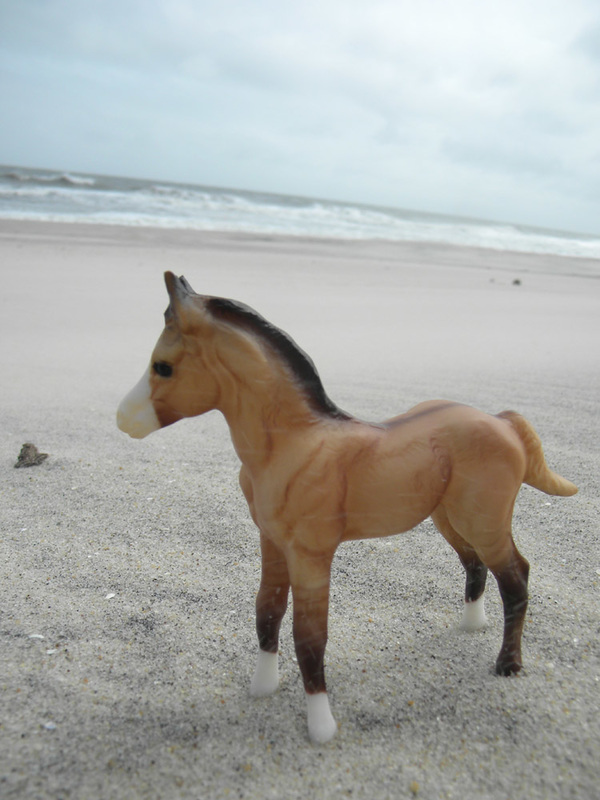 Assateague Beach, cloudy day, everything's pale but the sand is reflecting light evenly onto the subjects. Below: epic lighting... except for that hard edged unnatural looking shadow... maybe it's a mountain. Also, don't get your own shadow in the pic. Assateague Beach, less clouds (note blue sky at top), beaches and snow are hard to shoot on: set your exposure carefully: the camera will tend to underexpose things while compensating for the brightness of the sand/snow. With automatic cameras point at the darker object if you don't want it underexposed or change the settings. Backlighting can be fun... just be sure you have enough light on the subject ... or plan to make it a silhouette. ​Also a bit of low angle shooting on these two. 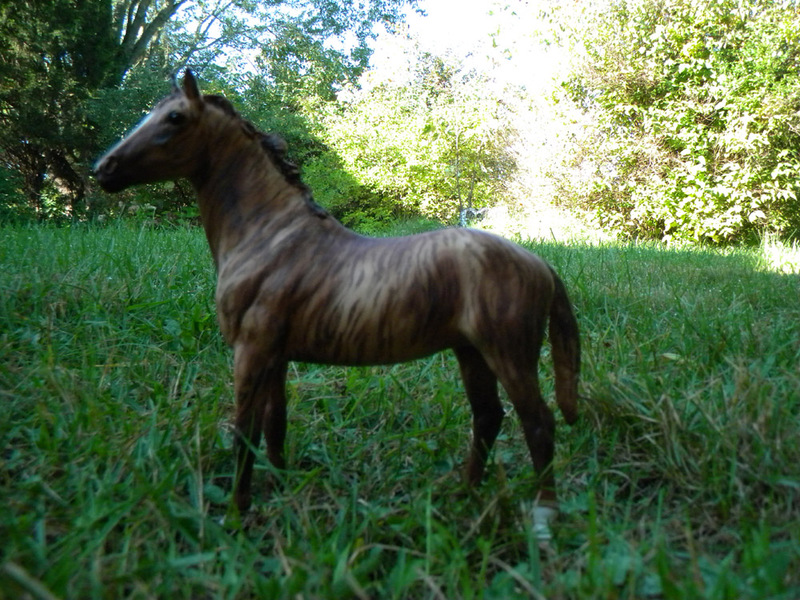 My brindle (a chestnut classic "Duchess" painted by me) mare looks totally different when photographed in open shade (shade, but with plenty of light bouncing off something, like a wall) against a white wall vs in the shade of a privet hedge (on a table with sand and reindeer moss). Beware open shade with red (or blue or yellow or whatever color) wall; it will affect your color balance. Photoshop is my friend. 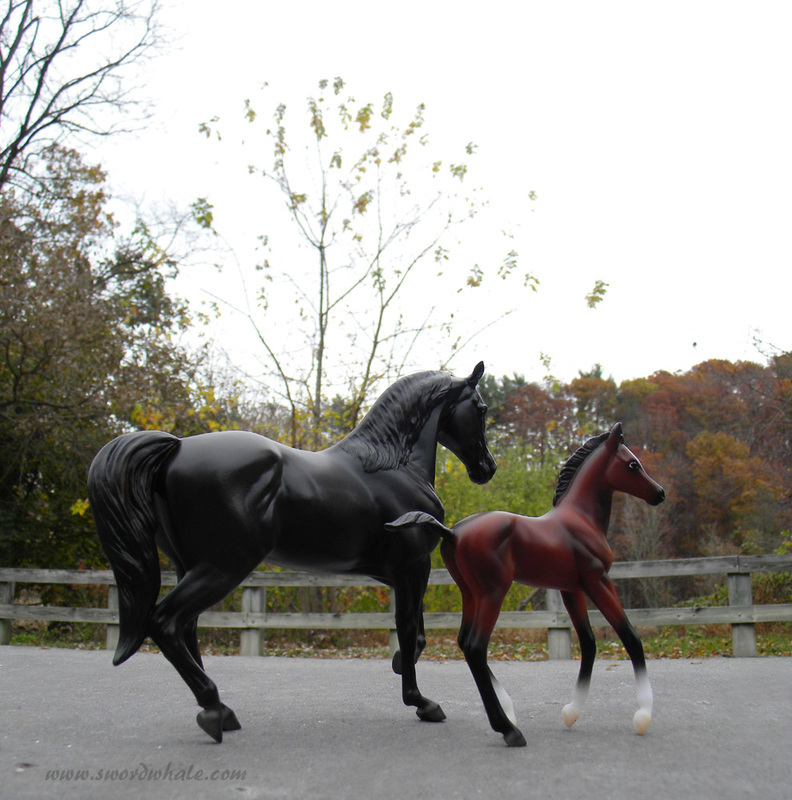 One black horse (and a bay filly) in the same spot on the Rail Trail gets me a variety of lighting. Very dark or very light subjects are more challenging. Pay attention to how your subject is catching the light. Shoot different exposures if possible. That moment on Photoshop when you converse like a mariner because the %*%^!! autofocus focused on the background not the horse. You can hold up a piece of paper or similar object (30% grey is good) in the correct position and focus the camera on that. Make sure the camera doesn't move after that (camera on tripod, or beanbag). ​Below: typical. 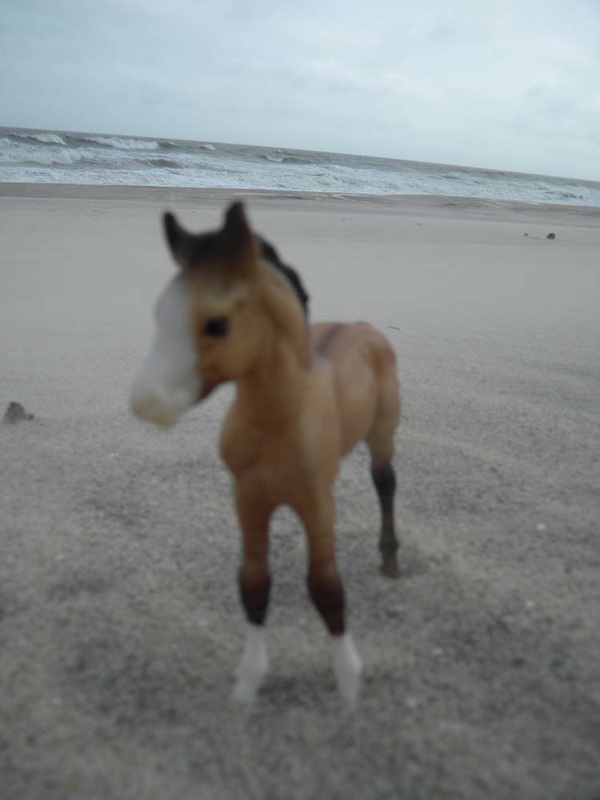 The classic sized (really short) foal is a blur blob while the surf is just fine. Just slightly out of focus (could be fixed on Photoshop), slight enough to not notice on camera's viewscreen. Check what you just shot, blow it up (zoom in on your file) and make sure it's in focus before you tear down your setup and put it all away. 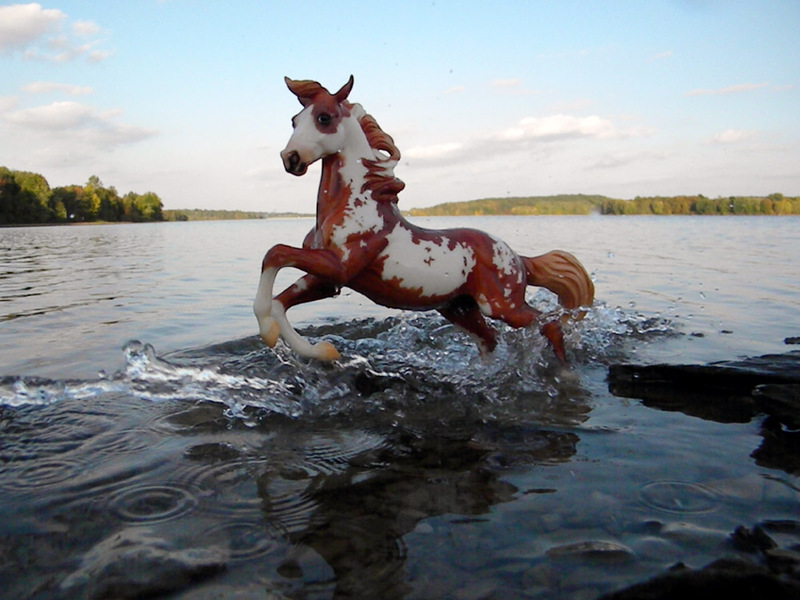 We sacrifice a bit of sharpness in the surf for clarity in the foal. 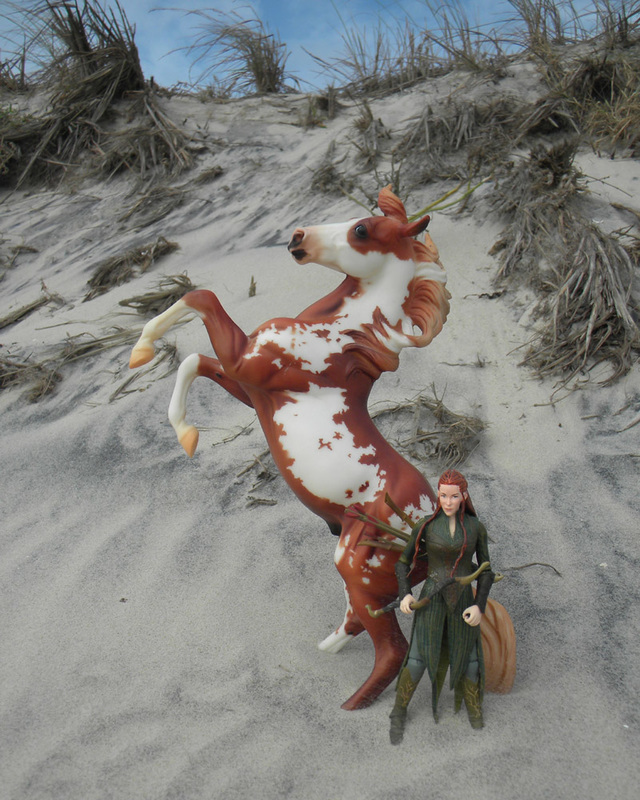 I could have Photoshopped a sharp background and a sharp foal together. Now you can see the blowing sand too. 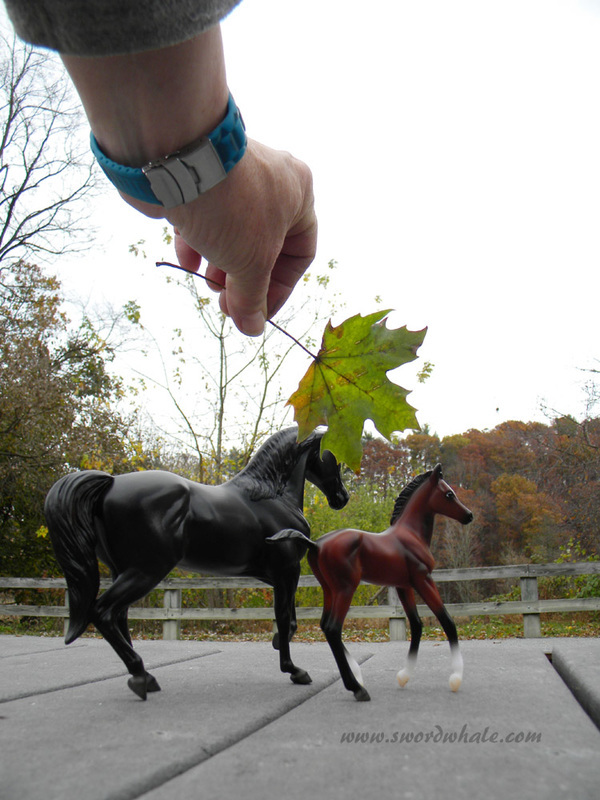 My camera wouldn't focus on the classic Morgan mare and foal... until I inserted a flat leaf. Focus on leaf, remove leaf, don't move camera (tripods help), shoot. Beware if leaf and horse are different shades, you may have underexposed. A general rule is; thing you're taking your light reading from is 30% grey. On my Nikon Coolpix L-100 I used the close-up mode, the regular mode, and landscape mode. 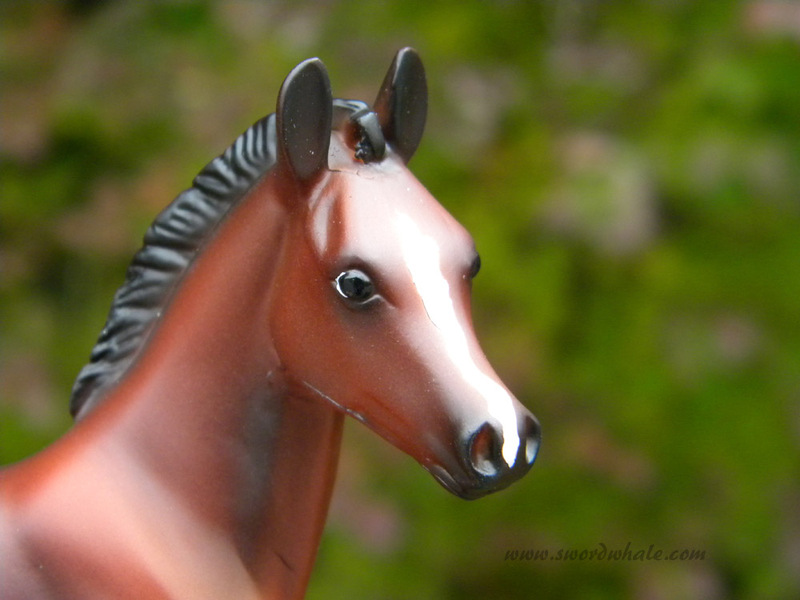 All got randomly blurry horses and sharp backgrounds until I made sure the camera had a flat object to focus on. Rocks (about 30% grey) also worked. 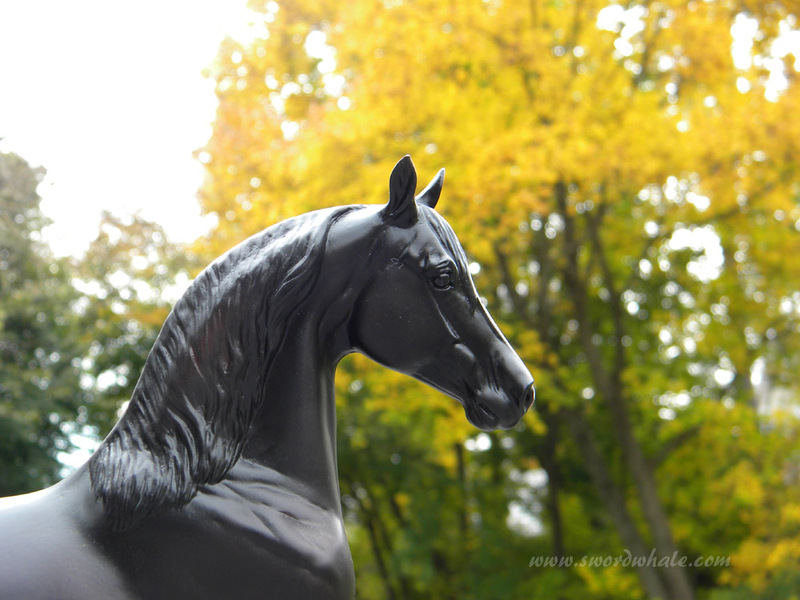 The shiny black horse at an angle, not so much. 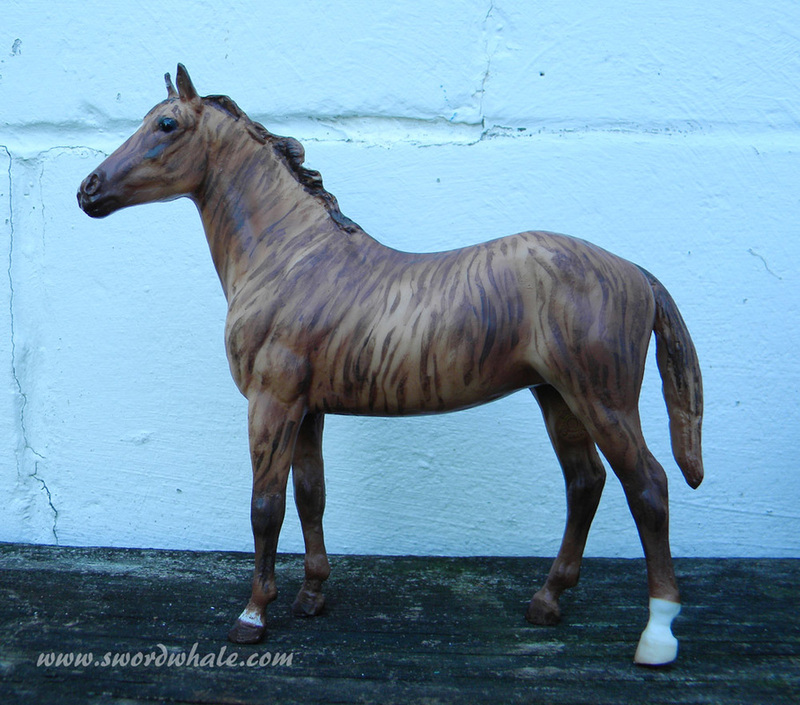 These very small Breyers (Stablemates series) are difficult to photograph. I needed to put them on a table to even get the camera to their eye level. I used sand and reindeer moss to create a foreground (gluing the moss to a board is better, it won't blow off, and mixing ModPodge and sand to create nice permanent sand that won't fall off is also good). I tried landscape, regular and closeup modes. Closeup seemed to work well but often I needed to focus on a board (about 30% grey). The background is slightly out of focus, which is fine. 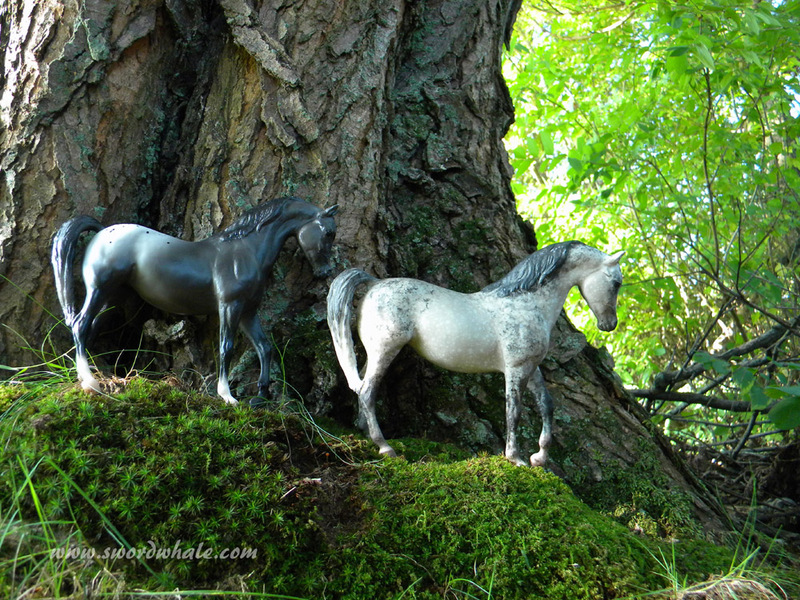 A table, sand and reindeer moss, as well as a few rocks, can make a great foreground for Stablemates and other small horses. I used the moss and rocks as well as a few bits of bark to disguise the edges of the table. The danger is creating a "sand arena" which doesn't blend into the background. 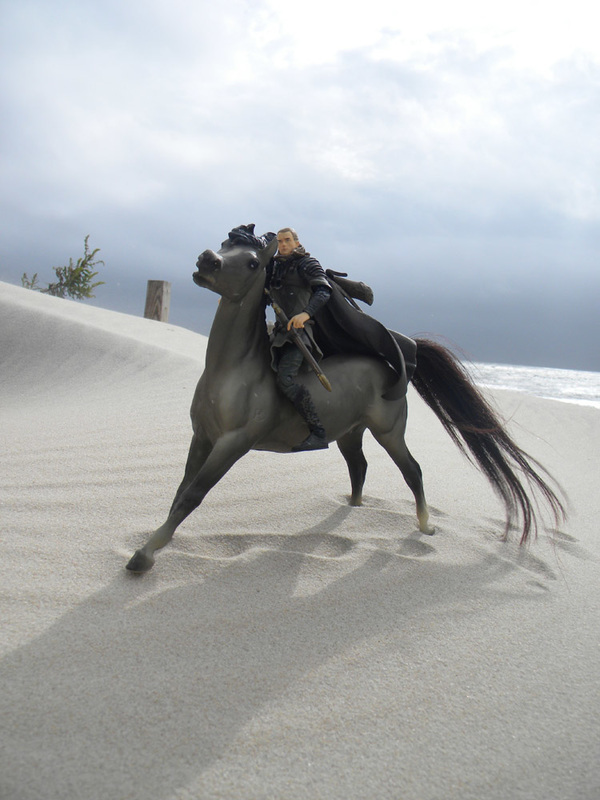 Camera angle makes a difference; a high angle shows all the horses, a low angle looks more realistic and makes the sand area blend into the background better. A lot of these models are highly detailed sculptures, but as you go close-up, you lose detail, so most of the time, head shots are kind of bleah. 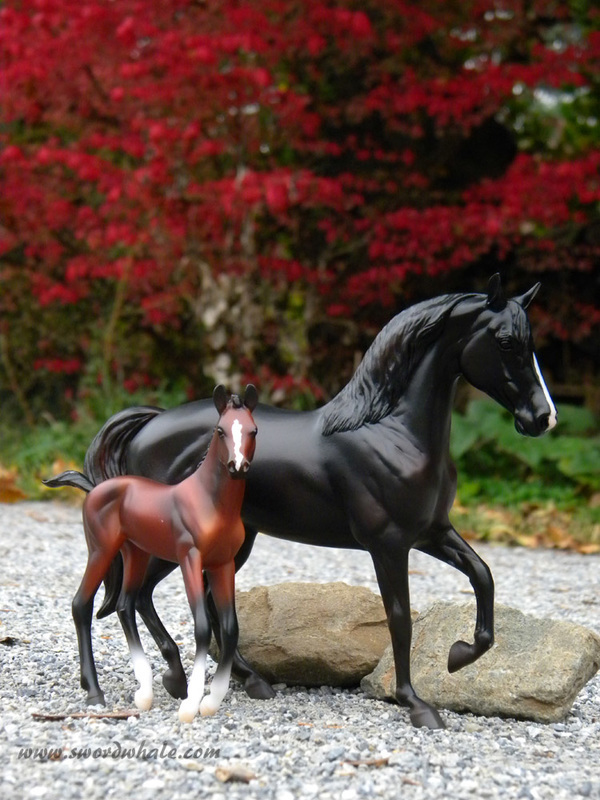 The foal in this set is awesome, but close-up is clearly a model. (although, check out the detail of color in those nostrils). 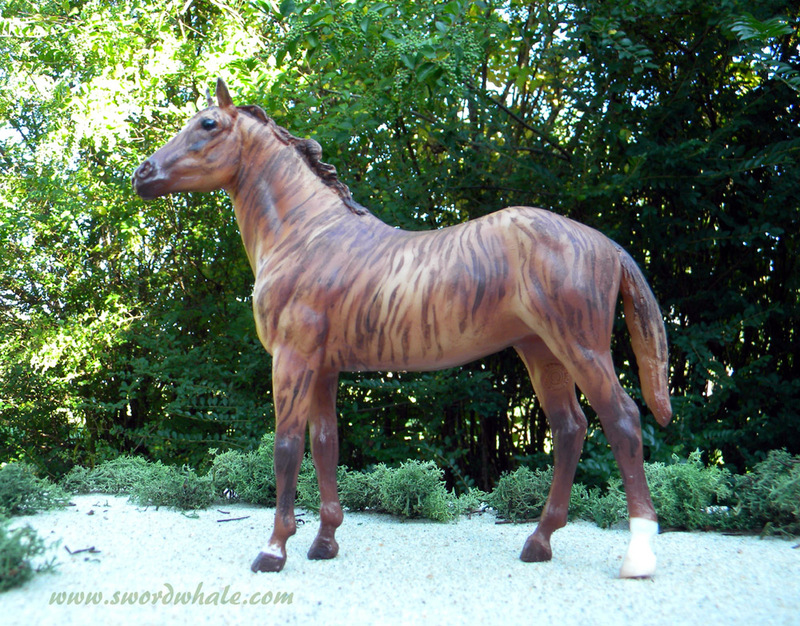 The mare is larger and more detailed. 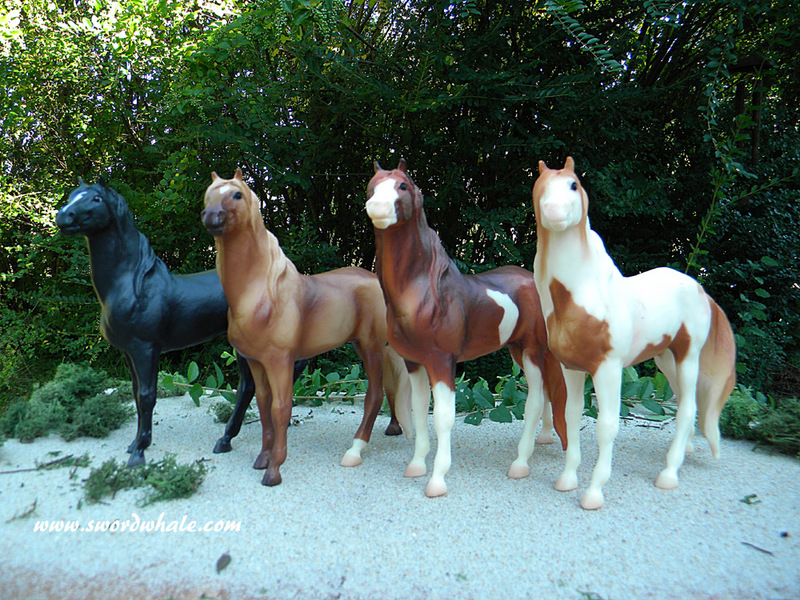 Your Breyer herd is like a palette. Like a crayon box of joy. You can put them wherever you want. Look at them from your camera's viewpoint and place sizes, colors and poses accordingly. 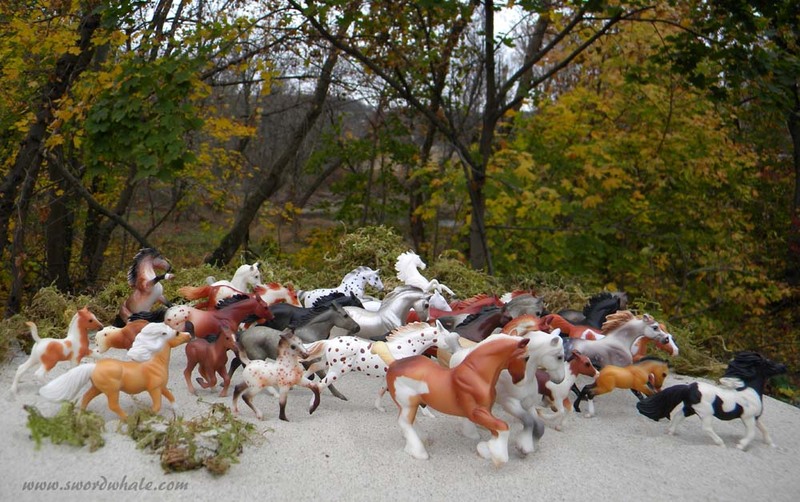 If you want an action shot, but don't have two dozen galloping horses, put the galloping ones in front, and the less gallopy ones behind. 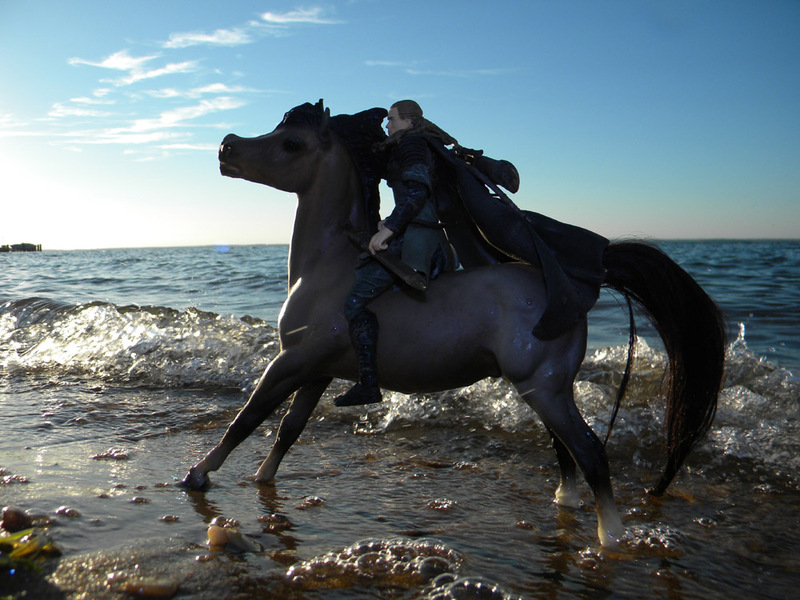 In the shots below, at least three horses are just walking, including the Black Stallion in the lead. 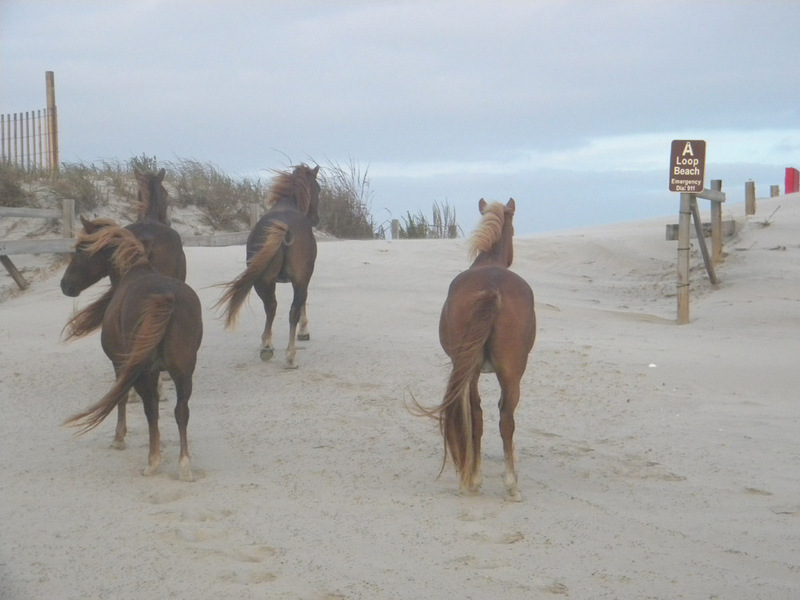 Two others are rearing horses, tilted so they look like they are leaping forward (use handy rocks or something). Some splashy water hides the walking feet. Sometimes all you need is a head on the other side to show there's more horses. 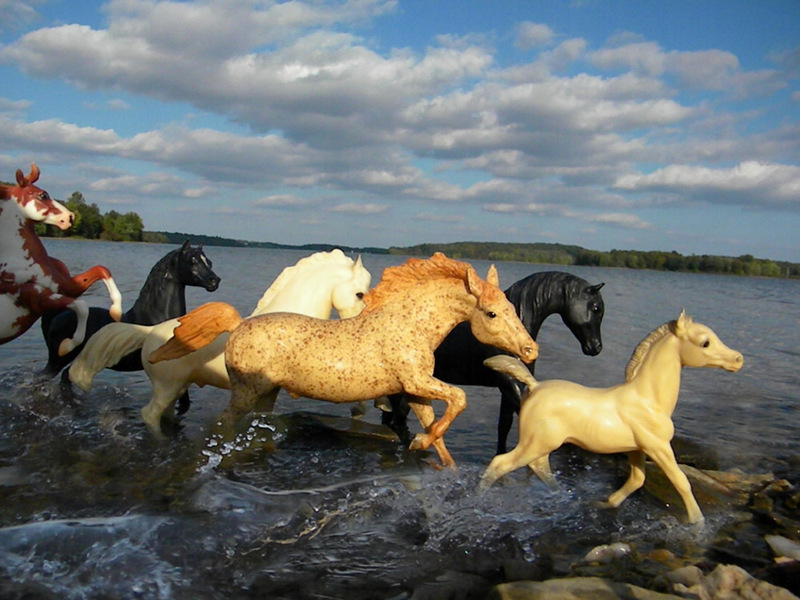 Don't put all your black horses, or palominos, or bays, in one spot. What kind of shapes are the heads and necks making? What kind of rhythm are the legs creating? Light against dark, color against greys and blacks, pinto against solid or Appaloosa. My instinct was to raise the camera, fly it over the herd so I could see all of them, but a too high angle and they again look like... models. Also, pay attention to close-ups. Does your model have the detail necessary to carry a close-up? Or does he look better from a distance? 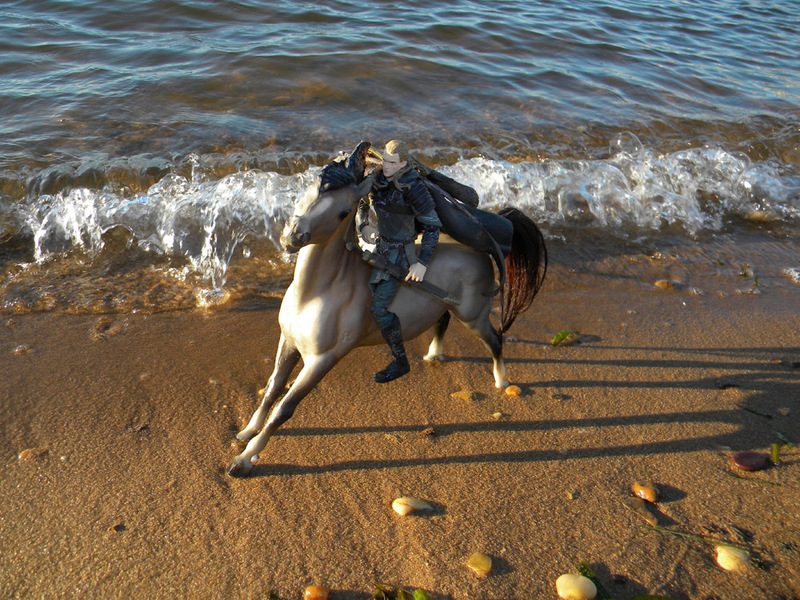 I've already mentioned throwing stuff: water, pebbles, sand. You can make filming easier (lying on a beach when there's a sandstorm in progress is not so much fun) by having a portable table, I have a foldy wooden one. 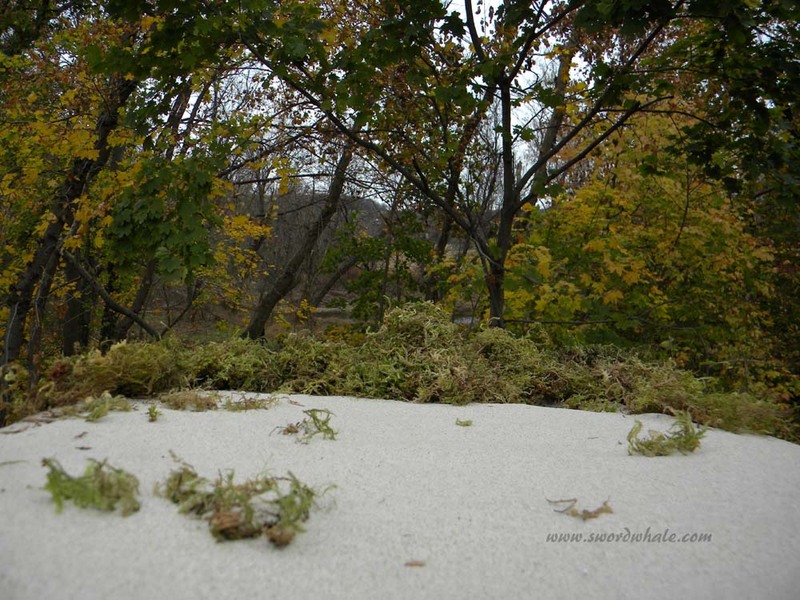 A bit of sand and some reindeer moss create a foreground. You can also make fence out of twigs, popsicle sticks or other items. A bit of random debris or rocks creates believable foregrounds. Careful of the crack in the folding table! And make sure your far edges are covered by moss, vegetation or rocks: no table edges! Judge me by my size, would you? 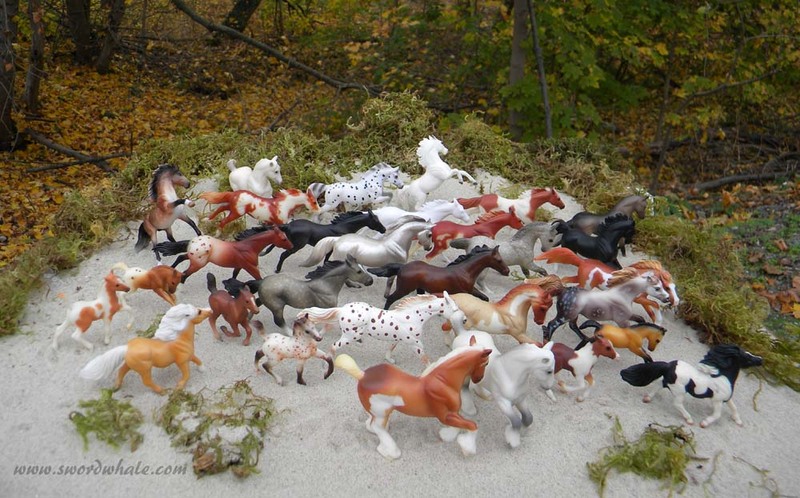 Get out those Schleichs, safaris, tiny Hartlands, Hagen Renakers, Stablemates and play.